Join us on September 26th in the Salinas office for a free presentation to learn how to protect yourself from scams, fraud, and ID theft! See the flyer for full details. 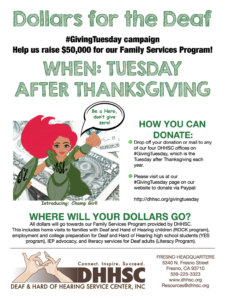 Today we kick off our new Dollars for the Deaf campaign, a #GivingTuesday fundraiser! Help us raise $50,000 for our Family Services Program! From now until #GivingTuesday, which is the Tuesday after thanksgiving (this year, that’s November 28, 2017), we will be asking anyone and everyone to consider donating a few dollars on that day. See the flyer for full details. We welcome all of you to work with us in raising the funds for these services, which include teaching ASL to parents of Deaf and Hard of Hearing children, IEP advocacy, employment preparation for Deaf and Hard of Hearing high school students, and literacy for Deaf adults. Visit our Giving Tuesday – Dollars for the Deaf page below for a link to donate online, and more. 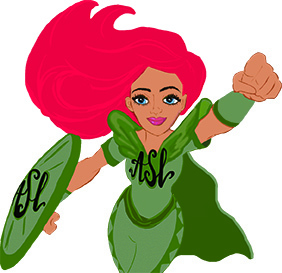 Finally, we are happy to introduce DHHSC’s new superhero, Champ Girl! Champ Girl is Deaf, advocating (through her superpowers) on behalf of our community! We will be sharing more information about her soon!